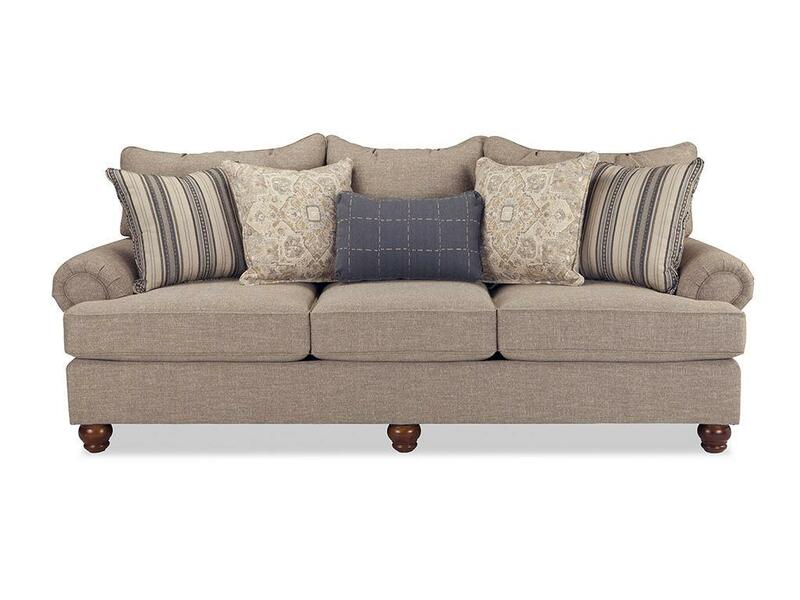 Craftmaster 797050PC Large Sofa set 100"
One of our all-time best sellers, this sofa has lots of style and at 100” in length, it has room for the whole family! It features 3-seats, 3 loose pillow backs, and 5 accent pillows, along with turned legs and a set-back paneled roll arm. But the comfort is what will win you over- deep and plush, this sofa uses our premium cushion and backs to give you a perfect place for relaxing at home. Matching loveseat, chair and ottoman available as well. Distance between Arms: 78 in. A – Hardwood Frame Consisting Of 5/4 Inch Hardwood Rails And Hardwood Laminates. B – Heavily Padded Arms. C – Tie Wires On Back & Seat Springs For Additional Support. D – Heavy Gauge Sinuous Wire Springs For Durability And Comfort. E – Heavily Padded In-Back. F – 100% Dacron Polyester Fiber Back Cushion Encased In A Sewn Ticking With Separate Compartments To Prevent Fiber Fall Down. G – 2.0 Density High Resiliency Foam Core With Dacron Fiber Wrapping. H – Fully Lined Tailored Skirts. I – Padded Edge Roll. J – Insulated Seat Pad For Added Comfort. K – Joints Are Mortise And Tenon Or Double Dowelled, Glued, & Corner Blocked For Durability. L – Wood Legs On Skirted Frames Are Built Into The Frame For Strength & Durability. Exposed Wood, Decorative Legs Are Securely Mounted To The Base Of The Frame.